Like everyone, my wardrobe has fluctuated over the years. In the past 10 or so years I've gone from being a uni student to working full time, changing careers, having two beautiful babies, over 2 years of maternity leave and now a part time working mum of two toddlers. While it's been fun unboxing my office clothes after maternity leave, it's eye opening to see that I'm wearing the last of the office dresses now, over 3 months since I started back at work. It's an interesting place to be at wardrobe-wise. Having more office wear than I need but not really wanting to let any of it go. It's not that I don't use office wear, just that I have much more than a part time worker needs. Not entirely sure if I should downsize more or just enjoy having lots of choice for workwear! Despite not being worn often, I love both of these sheath dresses. This dress is it, the final as yet unworn office dress, 3 months after returning to work. It's a beautiful dress and always gets compliments, perfect for the office and light enough for summer but not so light that it can't work for spring layered with a jersey blazer. The only reason it was the last office dress I had left to wear is that I prefer to wear it without tights. Now that spring has arrived it's the ideal weather for it. I wasn't sure if the bright yellow necklace would be too much with the orange print on the dress, but I really liked the bold combination. With all of the colour going on in my outfit, I picked a neutral cream blazer and a brown Balenciaga bag with camel flats, they look so nice together and were perfect to pair with the print and colour. Last worn: cream jersey blazer, orange printed sheath dress, camel flats, Truffle Balenciaga Day bag. Other ways to wear: cream jersey blazer and skinny jeans, sheath dress with layered knit, camel flats and wrap dress, Truffle Balenciaga Day bag and maxi skirt. 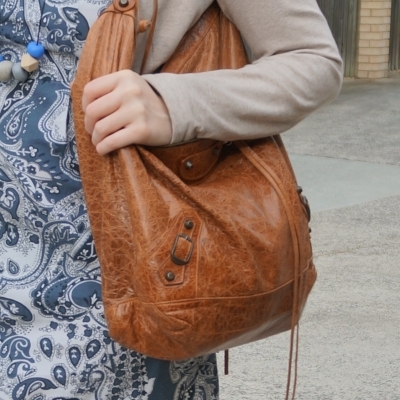 Perfect for pregnancy: blazer and belly band with an early baby bump, dress hiding an early second trimester bump, camel flats in third trimester, Balenciaga day bag for second trimester travel. 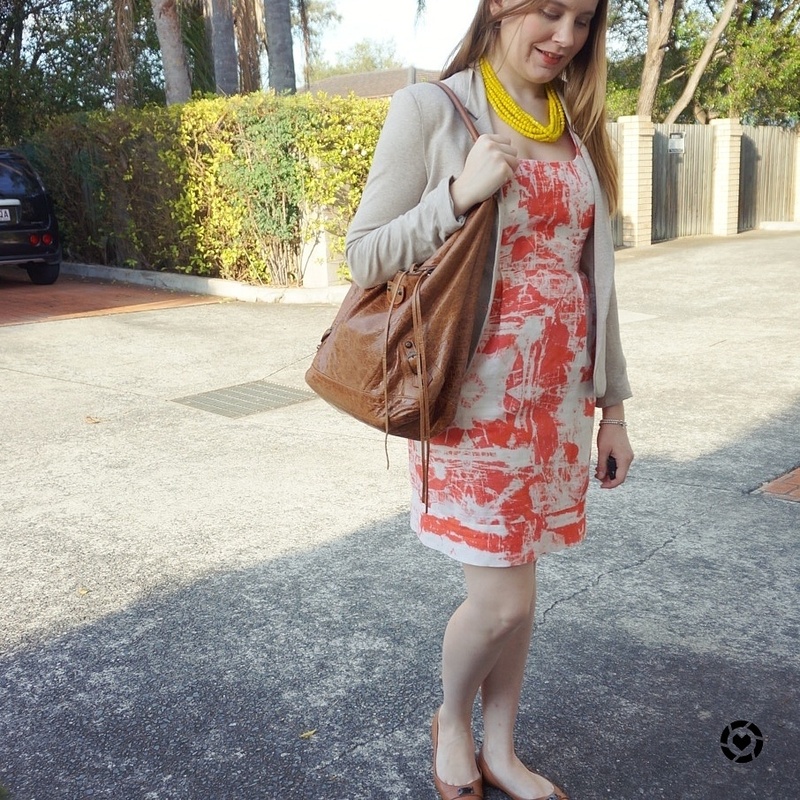 Another printed sheath dress, sticking with the same cream jersey blazer I wore above and the same Balenciaga day bag. As the blue necklace matched the blue print of the dress, I added a little more interest to my outfit with the gold mouse flats. I love these shoes so much, they are so cute but so wearable to the office too, a nice way to add a little personality to a corporate outfit. I've already worn this dress once since my return to work from maternity leave, but it was good to wear it again as it will always be one of my favourites! When I had my wardrobe detox session this was one of those 'hmmm' pieces in my wardrobe that the personal stylist stopped for a moment to consider - so of course I explained that I really wanted it to stay, and it moved into the 'keep' pile! It's actually one of the dresses I bought when starting out with my current company about 8 and a half years ago, it's definitely got staying power in my wardrobe! I've worn it 15 times since I started blogging, and many more times before then, one of those pieces I think I've already hit 30 wears on although sadly don't have a photo of every wear. It's worked for two pregnancies too - it's quite roomy, although with the zip up the back I've never worn it past the second trimester! Last worn: cream jersey blazer (above), Paisley print sheath dress, mouse flats, Truffle Balenciaga Day bag (above). Other ways to wear: cream jersey blazer and a-line skirt, Paisley print sheath dress and pink accessories, mouse flats and printed jeans, Truffle Balenciaga Day bag and shorts. 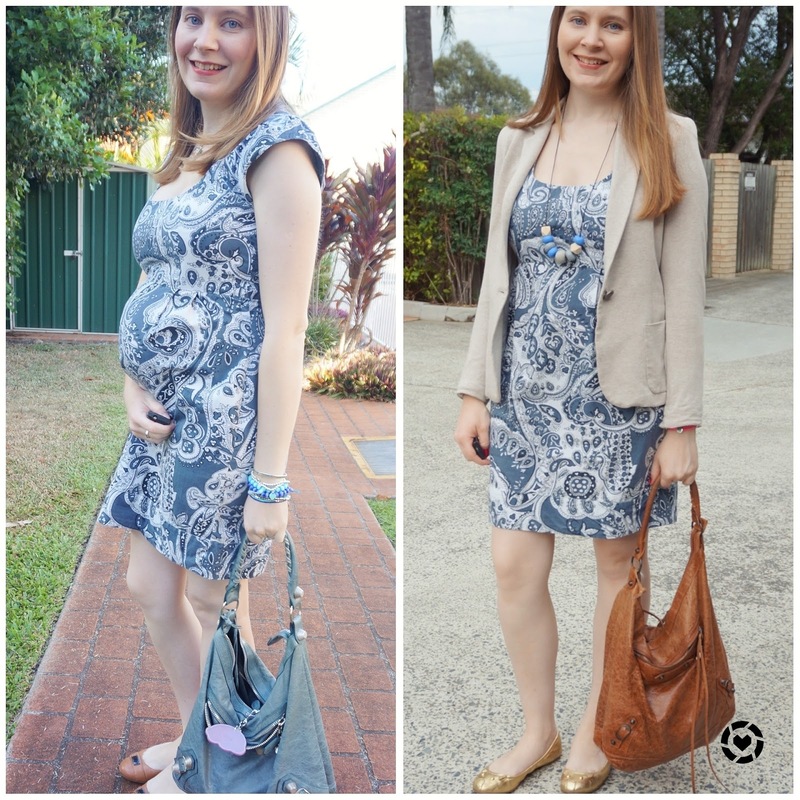 Perfect for pregnancy: blazer and hidden second trimester baby bump, paisley print dress in the second trimester, mouse flats in the second trimester, Balenciaga day bag in first trimester. Printed sheath dresses are quick and easy office outfits. With a printed statement dress you don't have to try to had with accessories as the dress makes a bold enough statement on its own. 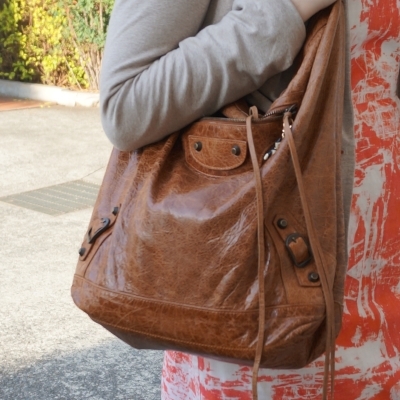 If you're unsure what to wear them with, stick with neutral accessories like tan bags and shoes that go with everything. A blazer helps add to the professional look and keeps you warm in the office aircon. Jeanswest have 40% off at the moment, perfect time to pick up some spring/summer pieces! New pieces as well as sale items are all reduced. I've already had a blast spending my saved gift cards there, stocked up on shorts! Couldn't resist this embroidered pair, a printed pair and this distressed pair to replace my other black ones. All 40% off means I still have 2 gift cards left to spend! Linking up with On Trend, Confident Twosday, Trend Spin, Turning Heads, Style Sessions, Wardrobe Wednesday, Style On The Daily. You wore both dresses beautifully. We can call them an all-season outfit. I mean, you can wear these dresses whether pregnant or not. Working or not. Shopping or not. Their versatility is endless. It's a good thing that you kept them. Keep them and enjoy the variety you have. Things will leave your wardrobe over time anyway, at least this is my experience. True, it is nice to have a lot of variety at the moment! You look amazing! love the necklace!! Mica, I am LOVING both looks! The dresses, necklaces and jackets look amazing together! You look beautiful girl! Hi Mica! Happy New week! I love both dresses especially the print. They are definitely versatile dresses and transition perfectly season to season. I really love the fact that you have worn the dress 15 times which means it has received a lot of love...and still looks awesome! Well I pray you have a beautiful week ahead! Dear Mica, yes, sometimes it is a dilemma with office clothes ... the question is really how much we need! Both of the dress you show today are beautiful and I'm not surprised that you always get so many compliments for the first dress - but I like the second dress, too! Both dresses are so pretty! I like the paisley print! It is amazing that they are both so versatile. These are both such pretty dresses, and I love them with your blazers and that bag. I am in a similar place having had a full-time office wardrobe and now just working part-time. It is hard to know what to do. It does make it difficult! It would be good to have more casual clothes as that's mostly what I wear, but at some point I will go back to full time so maybe I should keep it all...so hard to decide! They are such great flats! You wore both dresses so beautifully! Love the sheath dress! It looks FABULOUS on you! You can never go wrong with a cute knee length dress and a blazer for work. You want to think about keeping the clothes as you may go back to work full time at some point. Maybe just eliminate the stuff that you never where or find you don't reach for b/c you don't like it. I really love that first look - I think the bold color palette works to break up the monotony of an office look! I love the bright yellow necklace with that orange-print dress (it would also look good with the blue print one!). Great dresses, and good basics for you. There's no need to get rid of stuff you love - IF you love it! That French Connection dress is so classic and looks beautiful on you! No wonder it's one of your favorites. I don't even work in an office anymore but I still find myself hanging onto some of my old wardrobe because it works well for events and appointments. I'm glad you kept the second sheath dress, it's really gorgeous and I can see why you get so many wear out of it. I wasn't sure about the combination of yellow and the first sheath dress but it turned out really well. I loved reading this Mica because I am in such a similar situation. I have more office-wear than what I need too, but I hate to get rid of it! There are occasions when I do have to dress up more, so it's nice to have options for those days. I love both of these dresses and how the blazer makes them totally work for the office. Yes it's good to have the options there, even if it is a lot more options than I need, haha! Im lovin both dresses. It looks so chic on you. It is perfect to wear at work. Love these outfits for the office! That blazer is so cute - I'm loving the lighter color! It's been years since I had to wear office wear (I started working from home after I was made redundant) thank goodness. But even when I was working in an office, I don't think I ever looked as pretty as you in these two dresses! I particularly love the print of the blue one - I think both could be dressed up or down though, which is always a great thing! Great looks! Thats the nice thing about sheath dresses, the layering options are endless. Both of these dresses are so pretty! I love the patterns and colors. Your bold yellow necklace works perfectly with your orange dress! 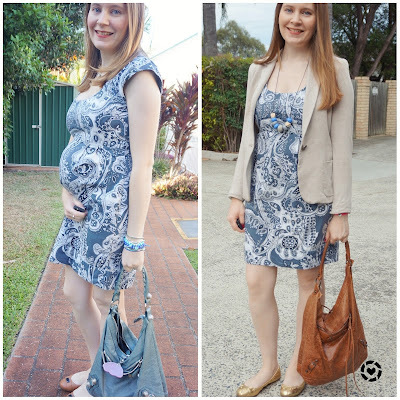 Loving these pretty printed dresses- they're so versatile! Even though you don't need as much workwear, I don't think you should get rid of it for that reason alone. Having super pretty dresses and blazers in your closet is always a good thing, in my mind. Even if I hardly wear my blazers now I still love them. Yes they are nice wardrobe options to have, even if rarely worn! I love the color of that bag! It's such a beautiful brown shade and both your outfits are so classy and stylish. Thanks for sharing and have a great week! You look so lovely in sheath dresses! I love the blazer you added it because it makes it ready for work. Those dresses are beautiful! I love the yellow necklace you paired with the first dress! I know what you mean about having too many work clothes since going part time, but there are honestly none I want to get rid of. Especially since I may end up going back full time at some point in the future. And it's nice to have the variety! Yes, I'm in exactly the same boat! I have more office wear than I know what to do with right now! This dress looks so stunning on you, I adore how you styled it! The blue dress is lovely! I'm glad it stayed on the 'keep' pile. Such a cute dress. I love the blue one! Having so many workwear options does seem silly sometimes, but I love having the variety and always have a hard time purging my wardrobe! I have the hardest time downsizing too, I love everything I have! You're looking pretty in both looks Mica. I'd love to see the second look with that bright yellow necklace! Thanks all for your lovely comments - it's interesting to see how many people mums are in the same position with a larger work wardrobe than they need right now!